Your horse may have never spent time in the wild, but nonetheless he shares traits with his untamed counterparts and his ancestors, honed by years of evolution. Understanding those traits can help you understand why your horse sleeps in a particular manner, while appreciating that he has preferences just like you do. These preferences typically change with age. Horses can sleep with their eyes either closed or open -- and somewhere in between, with their lids half-closed. Whether your horse’s eyes are open or closed is likely an indication of how sound he is sleeping, with open eyes indicating a lighter sleep. To get that all-important, deep REM, or rapid eye movement sleep that humans crave, he needs to have his eyes closed. Not only can your horse sleep with his eyes open, but he can also sleep standing up; in fact, most of his sleeping time is done this way. He has a handy mechanism in his legs called a “stay apparatus,” allowing him to relax his muscles while keeping his legs locked in position to hold him up. He also takes advantage of this when relaxing after a hard workout, to give his tired muscles a break. If your horse is standing with his eyes open, look at his lower lip and hind feet: If his bottom lip is relaxed and drooping, and he has one hind foot cocked, or resting on its toe, he is sleeping or dozing. The way your horse is built makes lying down for long periods of time difficult, as well as dangerous. Physiologically, your horse’s legs support a lot of internal weight, so lying for any length of time can actually cause pressure on his organs. For older horses in particular, it becomes difficult with age to get up. 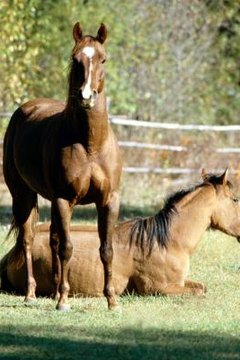 Young horses typically need more sleep so you’re likely to see them lying down more frequently than their adult counterparts. Your horse is a prey animal, and his sleeping mechanism and preferences reflect that, even though he is not likely to be attacked by a pack of mountain lions next to his barn. By being able to sleep while standing, he is able to run out of harm’s way quickly without scrambling to get up and flee. Among a group of horses, if one or more is lying down, you are likely to see at least one who is not so he can keep an eye out for danger. The Washington Post: Ever Wondered Why Horses Sleep Standing Up?